This weekend, New Orleans hosts the Humana Rock’N’ Roll Marathon and Half Marathon, one of the largest marathons in the nation. More than 12,000 athletes and their supporters will take to the streets in a celebration of live music, running, and the city itself. There’s a 5K, 10K, half-marathon, and marathon race. All take place on Sunday, February 10, except the 5K, which kicks off at 8 a.m. Saturday, February 9. The marathon route starts by Audubon Park in Uptown, proceeds down St. Charles Avenue to the CBD, and cuts through the French Quarter. Then it heads north up oak-lined Esplanade Avenue, traces the edge of City Park, veers right on Lakeshore Drive and loops back on itself, ending at Roosevelt Mall in City Park for the beer-soaked after-party. Lafayette Square area: closed 3 a.m. to 9 a.m.
St. Charles Avenue area: closed 6 a.m. to 10:45 a.m.
Convention Center / Cruise Terminal area: closed 6 a.m. to 11:15 a.m.
French Quarter area: closed 6 a.m. to 11:15 a.m.
Lakeview area: closed 7:30 a.m. to 3:15 p.m.
Lakeshore Drive area: closed 7:30 a.m. to 3:00 p.m. 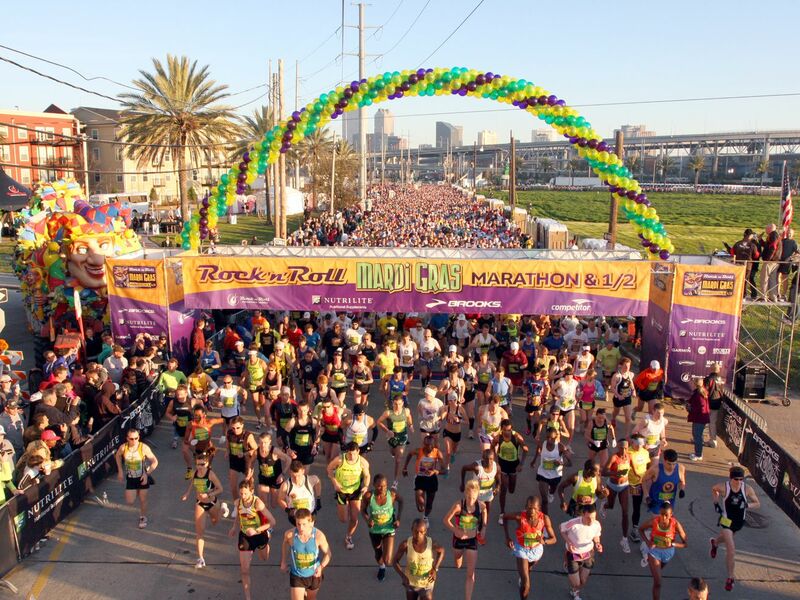 The Rock ’N’ Roll marathon also holds a Health & Fitness Expo at the New Orleans Morial Convention Center in Hall C. The expo, which is free and open to the public, will be held from noon to 6 p.m. on Friday February 8, and from 9 a.m. to 5 p.m. Saturday, February 9.